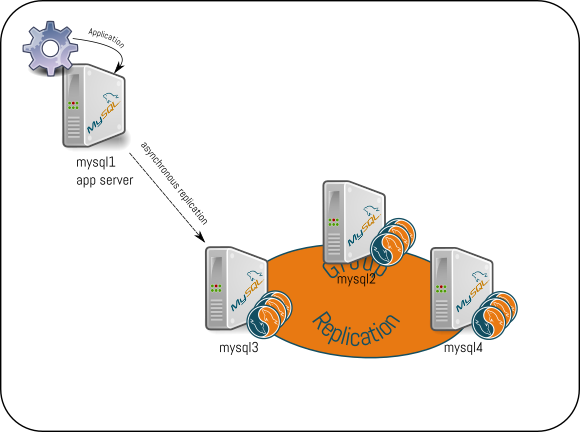 The instance 'mysql3:3306' is not valid for Cluster usage. 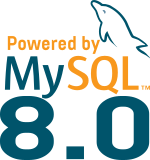 A new InnoDB cluster will be created on instance 'root@mysql3:3306'. 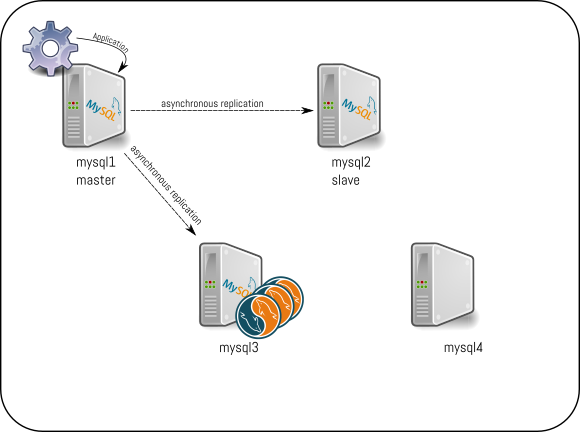 The instance 'mysql4:3306' is not valid for Cluster usage. The instance 'mysql4:3306' is valid for the cluster. The instance 'root@mysql4:3306' was successfully added to the cluster. 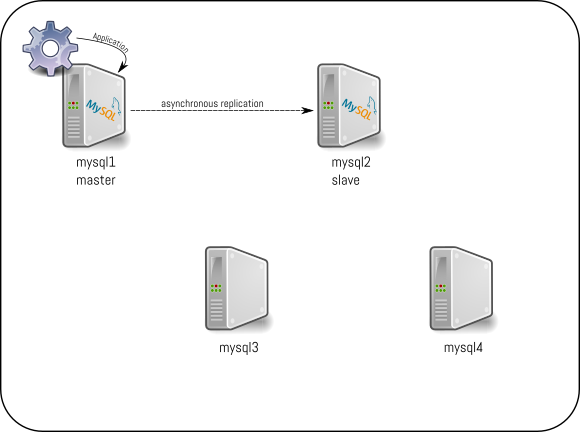 MySQL Router  has now been configured for the InnoDB cluster 'MyInnoDBCluster'. I have mysql master + slave custer. 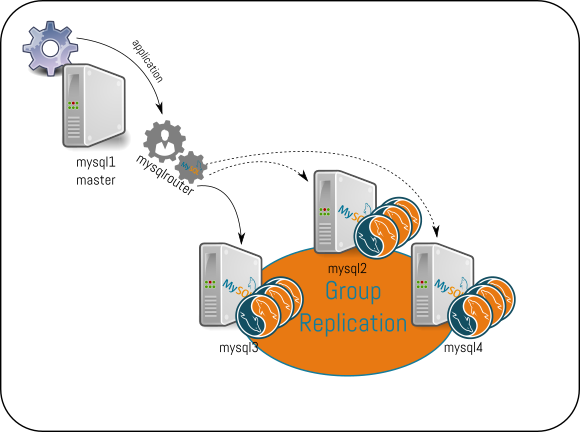 and MGR cluster. I want to make the two culsters as Master +Salve + Slave(MGR). that’s is ok? But I didn’t configure successfully， Can you tell me how to configure the cluster? If that’s the case you, need from the current Async Slave, take a backup to provision the 3 nodes in the cluster, then create the group. The Primary member in the group then needs to be configured as Slave of the Asynchronous Slave (or you can do in the same order as explained in the blog post). – only the Primary member of the group can be an asynchronous slave of the current async slave. 2. dump from slave , and restore at 3 node. I will need to test that scenario, usually I setup asynchronous and then the Group. I’ll be traveling, so my test will be delayed but I will try your scenario and come back with the solution. I have another question about data synchronization delay, whether to write data, the cluster of each node will be read immediately to get the data that is just write, if not, how to solve the problem. or if proxysql can do the same things. if it’s ok, how to do? given scenario works perfect when we have gtid_mode=ON on mysql 5.6 node. How do we Migrate the same when we have gtid_mode=OFF(default) on mysql 5.6. How do we set up a Innodb cluster that acts as a slave node to mysql 5.6 Node with gtid_mode=off. Can you please help on this scenario. Regards and keep me posted. I have tried the same approach having an intermediate node which is acting as a master to innodb cluster. The issue i am facing here is mysql 5.6 is with gtid_mode=off and the transactions that ran on mysql 5.6 are not generating GTIDs.The intermediate node should be either OFF_PERMISSIVE/ON_PERMISSIVE for master-slave to work. for either case, as the transactions from 5.6 is non -GTIDs, intermediate node treats them as anonymous transactions and they will be replicated in the same way to the cluster. Cluster which is acting as slave is unable to read the anonymous transactions as it must have GTID on. Also, i was wondering like how do we make a backward compatability i.e., from a cluster to mysql 5.6 with GTID off. To keep you posted, We were able to acheive this scenario with the help of streaming binary logs. From the Master(which has GTID=off), we had set up a asynchronous slave of 5.7(with GTID=ON_PERMISSIVE). From the 5.7 asynchronous slave, we started streaming of binarylogs to the CLUSTER instance. As this streaming inserts data into the cluster node as a client, we didn’t face any issue with the process. We had used this intermediate node for streaming the binary logs. We used intermediate node just to identify if there are any statements that are violating GTID’s and 5.7 upgrade. Galera supports innodb tables without PK? By default it’s not and even if you can enable certification of tables without PK, this is absolutely not recommended. It can lead to some minor issues like different orders of the records in the different nodes and delete operations might fail. that was ok to set up my InnoDB Cluster starting from a MySQL source single installation. Now, with my InnoDB Cluster running, I need to add to it more databases coming from other MySQL sources. What’s the correct way to act ? mysqldump to export from sources and than import to InnoDB Cluster could do it? or mysqlbackup on sources using –tts and –include-tables and restore to InnoDB Cluster ?